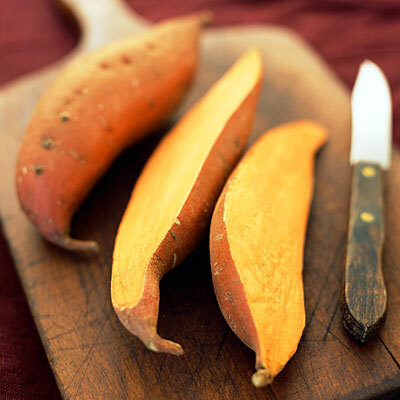 No surprise that sweet potatoes are at the top of nearly everyone's healthiest foods list. One baked, medium-sized sweet potato contains 438% of your daily value of vitamin A (a white potato contains 1%), 37% of your vitamin C, and some calcium, potassium, and iron too. All this at just 105 calories! What's more, they also deliver 4 grams of dietary fiber—16% of the daily value—and absolutely zip in terms of fat. And luckily there are many ways to whip them up. Here are 25 great (even kid-friendly!) sweet potato recipes.